We’ll find out the details on 11 December. WE NOW KNOW all 16 teams that have progressed to the knockout round of the Uefa Champions League. And we could see some very tasty fixtures thrown up when the draw for the next stage is made in Nyon, Switzerland on 11 December. The Round of 16 is a little unique because, unlike from the quarter-final stage onwards, eight teams will be seeded. The sides who topped their groups – in theory – have an advantage. But because of how some groups played out, there are high-profile unseeded sides waiting in the long grass. Added to this, teams from the same domestic league can’t be drawn against each other. And, if teams have already met during the group stage, they can’t play each other again. Also, there are five Premier League clubs through to the next stage, which means there are only a select few teams that can be drawn to face them. For instance, Manchester United can’t face Basel or Chelsea. So immediately, their potential opponents are one from Bayern, Juventus, Sevilla, Shakhtar Donetsk, Porto and Real Madrid. Ominously, because they failed to do what so many other English top-flight teams managed this season, unseeded Chelsea can now only possibly face three teams in the next round: Paris Saint-Germain, Barcelona or Besiktas. The seeded teams will host the second-leg and ties will be played between mid-February and mid-March next year. Seeded: Manchester United, Paris Saint-Germain, Roma, Barcelona, Liverpool, Manchester City, Besiktas, Tottenham. Unseeded: Basel, Bayern Munich, Chelsea, Juventus, Sevilla, Shakhtar Donetsk, Porto, Real Madrid. Email “The Champions League knockout stage draw is set to throw up some very juicy ties”. 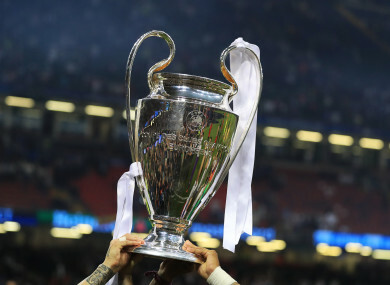 Feedback on “The Champions League knockout stage draw is set to throw up some very juicy ties”.